Christopher Nolan’s Batman series has had a huge impact on us. Why? Because it’s closer to reality and there are almost no loopholes in the movie. 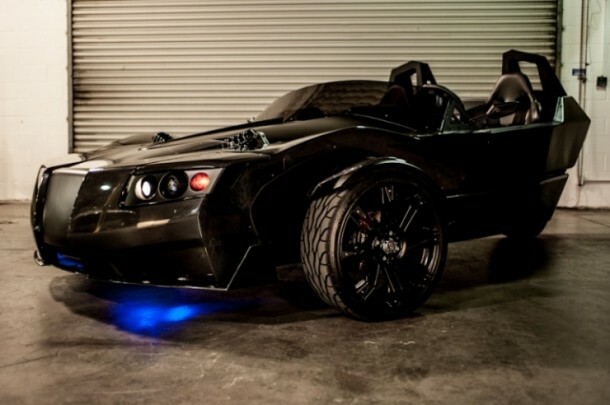 We all were impressed with the bat-mobile and how it was portrayed in the movie.’ Does it come in black?’ is the question that will cross your mind once you set your eyes on EV TORQ Three Wheeled Roadster. The vehicle was publicly introduced on 6th April, 2013 and no doubt many of the people who saw it stated that it reminded them of the bat-mobile. Boy oh boy, one would definitely look cool sitting in that Roadster and being all serious just like batman. Chris Anthony is the name of the founder of car maker “Epic”. He has stated clearly that while designing TORQ, he was going for more fun while incorporating practical engineering. The result, ladies and gentlemen, is TORQ. Anthony says, “While seeking record breaking MPGe with the 3-Wheeled Aptera Electric Vehicle I often found myself longing for a more aggressive styled and track worthy adaptation. The TORQ will create a class of its own with its perfect balance of power, handling and aggressive styling. The TORQ Roadster confirms that you don’t have to compromise performance to embrace efficient vehicle technologies.” Now let’s move on to numbers and statistics. Yes, we know you are waiting to read about its horsepower and top speed and what not! Well, the three wheeled electric vehicle is capable of achieving a speed of 0-60 Mph in four seconds. The electric motor can deliver about 600 lb-ft- which equals 813 N-m) of torque and over 400 HP which equals 300kW. The track width of this three wheeled roadster is 80.5 inches- which is almost 2 meters- and this aids it in cornering. The specs have been released by Epic’s Research and Development centre in Vista, California. Engineers at R&D seem quite hopeful with the performance of TORQ. Ok, we gave you the specs of the engine, but is it good when it comes to slowing down? Can the brakes handle this Roadster? See for yourself, Epic’s EV TORQ Three-Wheeled Roadster comes with Wilwood 4-piston brakes and a Flux Power Lithium ion battery. If you ask us, the roadster is pretty impressive; with the speed, power that it possesses and its capability of achieving 60 Mph just within 4 seconds is quite fantastic. The Roadster reminds us of Bat-mobile and is the car to own if you plan to impress your friends or make an impression on the neighborhood. You can be your neighborhood’s dark knight. The possibilities are endless! Woah this blog is wonderful i like studying your articles. Keep up the good work! You understand, lots of people are hunting round for this information, you can help them greatly.